A 150-year-old abandoned mansion, 500 volunteers and 80 actors are producing one of the biggest scares in our area this time of year. WASHINGTON — Most months of the year, the campus at the Arc of Loudoun, a nonprofit school dedicated to educating and supporting children with disabilities, is calm and peaceful. But come October, things get a little weird. It’s not unusual to find a gallon of “professional quality blood paint” on the desk of facilities director Matt Smith. And Lisa Kimball, chief executive officer of the Arc of Loudoun, is used to answering emails in her office to the sound of bloodcurdling screams echoing down the hallway. The stench of fuel in the fall breeze? “They’re just testing out the chain saws,” a staff member explained. There’s an equally casual explanation for the smell of mildew inside the property’s abandoned 19th century mansion: it’s a special diffuser designed to set the scene — a scene of pure terror. That’s because in October, the Arc of Loudoun transforms into one of the region’s largest and scariest Halloween destinations for its annual Shocktober event. “During the day, we’re all really hard working,” said Kendra McDonald, director of clinical services at the Arc of Loudoun. Come sundown, Loudermilk layers on make up lacerations, changes into a bloodstained apron and goes by “Mawmaw,” one of the creepy characters hiding inside the dark mansion. The Arc of Loudoun provides one-on-one support (sometimes two-on-one support) to students with intellectual and developmental disabilities, and to help pay for the quality of care administered, it often turns to fundraising. “But in the meantime, the gift of it is it’s also kind of creepy and scary,” said Kimball, who added that paranormal investigators have detected activity inside the mansion. Over the years, the monthlong haunted house has turned into a yearlong effort. Smith, whose unofficial school title is “haunt master,” attends conferences to check out the latest trends in the industry and to track down the scariest products. He plans the details of each room’s design and storyline well in advance. 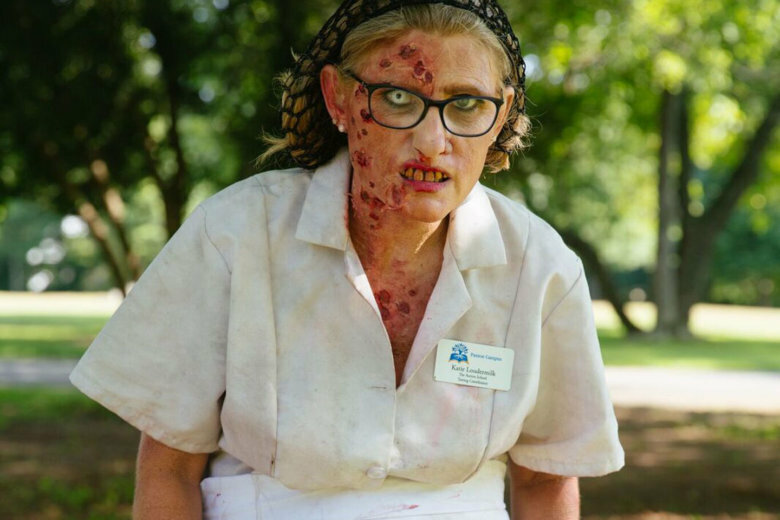 More than 80 volunteer actors (many of whom are students in Loudoun County Public Schools) attend “ghoul school” to fine-tune their scare tactics, and more than 500 volunteers work to make sure the thousands of visitors enjoy — or at least make it through — the experience. 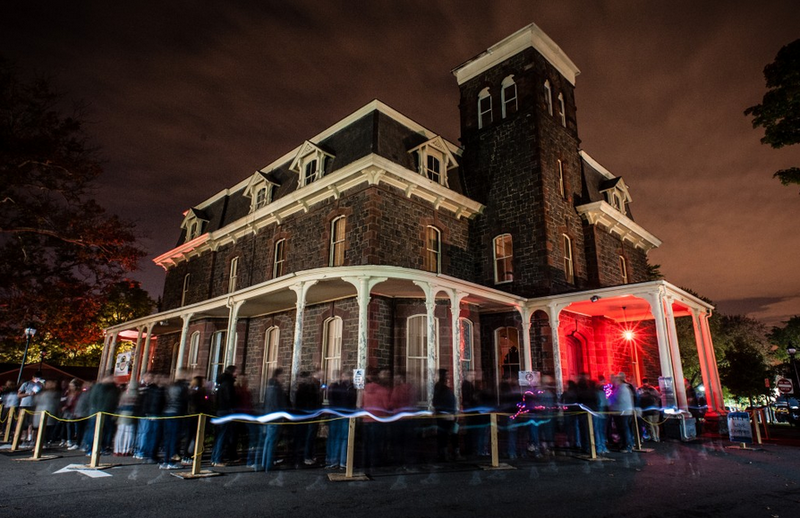 Last year’s Shocktober attracted 12,000 people and raised more than $400,000. Kimball predicts this year will be even bigger. Shocktober is open every Friday, Saturday and Sunday from Oct. 5 through Nov. 4. Tickets are $35 online/$40 at the door and include entry into three levels of Paxton Manor, plus its basement, Carnival of Souls. Concessions, including beer from Old Ox Brewery and wine from Tarara, are available for purchase. More information is available on the event’s website.